CHENGDU, China, Sept. 14, 2018 /PRNewswire/ -- Chengdu Parcours Art Festival, an inaugural art event hosted by Chengdu International Finance Square (Chengdu IFS), was unveiled on September 13 as part of its international partnership with the Saint-Germain-des-Prés Committee in Paris. With the theme "Chengdu Impressions: Two Cities Tied by Art", the event brings the spirit and concept of the Paris Parcours Festival to Chengdu, "Making art an integral part of life", showcasing contemporary art installations of impressive artistic value and modern charm to present an art feast to the public. At the same time, the 2nd T China International Style Conference also started on September 13 in Chengdu, serving as the opening ceremony for the Chengdu Parcours Art Festival. Another key event jointly organized by Chengdu IFS, this time in conjunction with New York Times Style Magazine China (T Magazine China) with the theme "Art Precedes", the conference will host dozens of renowned international artists including Mr. Philip Tinari, Director and Chief Executive Officer of UCCA, Beijing; Mr. Sui Jianguo, the most recognizable artist in contemporary sculpture scene of China, professor of CAFA; and Mr. Liu Xiaodu, the principal architect and co-founder of URBANUS Architecture & Design Inc. The artists presented the relationships between urban public spaces and art, using the lens of art to explore the past, present and future of cities and inspire people to contemplate the experience of living in cities from the perspective of citizen aesthetics. As a key part of the Chengdu Parcours Art Festival, Chengdu IFS, in partnership with fashion brands FENDI, Chopard and LOEWE, will jointly present themed art exhibitions during the event. Chengdu IFS will also work with Huasheng Media, for cooperating with MOYNAT, LONGCHAMP, Edition, COMME MOI and BING XU, to launch limited-edition fashion that infuse Sichuan elements during the festival. The first Chengdu Parcours Art Festival received support from the governments of Chengdu City, Jinjiang District of Chengdu and the 6thArrondissement of Paris. Mr. Chen Lizhang, secretary of Jinjiang District Government; Mr. Wang Qian, Head of Jinjiang District Government; Madame Fabyène Mansencal, Consul General of France in Chengdu; Mr. Jean-Pierre Lecoq, Head of the 6th Arrondissement in Paris; and Ms. Monique Mouroux, Secretary General of the Saint-Germain-des-Prés Committee in Paris, attended the opening ceremony of the festival. Ms. Christina Hau, General Manager of Operations of Wharf China Estates Ltd.; Mr. Xuan Feng, Editor-in-Chief of T Magazine China; Ms. Anne-Pierre d'Albis, Founder and president of Parcours Saint-Germain; Mr. Jing Boran and Ms. Zhou Dongyu, Conference Promotion Ambassadors; as well as Ms. Karena Lam, Conference Art Ambassador, attended the opening ceremony. Artists from China, the United States, and Germany, etc. also gathered to evoke a city's thinking on art by means of cutting-edge ideas. At the opening ceremony, Ms. Christina Hau, General Manager of Operations of Wharf China Estates Ltd., said that, "Chengdu IFS has always been committed to promoting the fusion of business, art and culture, and making art an integral part of everyone's life." "By combining trends and art, synchronizing traditions and modernity, integrating innovative local and international approaches, we aim to arouse the public's curiosity and enthusiasm about art, stimulate their thinking on the relationships between urban public space and art as part of our unrelenting efforts and explorations to promote art among the public," she said. Ms. Anne-Pierre d'Albis, Founder of Parcours Saint-Germain, also commented: "Since Parcours was founded in 2000 on the romantic Left Bank of Paris, the event helped to embed avant-garde art works into public spaces, allowing locals to explore and feel art while on their leisurely strolls." She said, "I feel privileged and proud to have Parcours appears in Chengdu, the land of abundance, which is similar to the Paris. While Parcours brings Chengdu a deep sense of art, the city injects Parcours with its oriental essence and spirit." The 2nd China International Style Conference, which doubles as the opening ceremony for the art festival, converges new trends and great ideas, putting Chengdu on the world map and showcasing its distinctive lifestyle, unique values for humanity from the perspectives of fashion, design, art and culture. As Chengdu IFS strives to create a landmark urban public space around Hongxing Road, the event has invited six Chinese and foreign artists to present their understanding of the city of Chengdu based on their emotions and memory of cities, manifesting their experiences through various art media. A large graffiti installation Chengdu Impression jointly created by German graffitist MadC and Chengdu artist Ma Kun is on display at Hongxing Road. MadC painted shade and colour on the wall, displaying her impression of Chengdu with sparkling lumps of colour. On the other hand, Ma Kun rejunvenates Chinese characters with graffiti, showcasing poetry about Chengdu by Tang Dynasty poet Du Fu through calligraphy painting. Oriental and Occidental arts merge and collide on the 80m-long Chengdu Impression, serving as a medium for Chengdu to talk with the world. The Dutch artistic duo of Michiel Martens and Jetske Visser show their work Reflecting Holons for the first time in Chengdu. In a specially made mirror space, the work glows with vigour. As soon as visitors approach, the installation sparkles multi-coloured light, triggers viewers to rethink the relationship between the human body, urban space and movement of light. At the invitation of Chengdu IFS, Mr. Chen Weicai and Mr. Zhao Mi, two Sichuanese artists who were invited to attend the 18thParcours Saint-Germain in May, also presented at the exhibition. The two artists remade their works with combined elements of Chengdu's unique urban environment and business space. 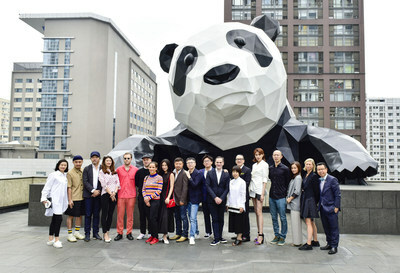 During Chengdu Parcours Art Festival, Chengdu IFS and international fashion brands FENDI, Chopard and LOEWE jointly launched themed art shows that combine fashion and art. FENDI had nine craftsmen and artists to reinterpret the double F logo of FENDI. Inspired by sustained gardening and botany, Chopard artfully put together green plants and fresh flowers to create a garden of eternity. LOEWE invited a designer to use bamboo to make furniture including its Steamer series chair, MU hanger and more. The three brands helped power Chengdu Parcours Art Festival with their finely-crafted blend of art and fashion. Chengdu IFS also worked with Huasheng Media, to collaborate with MOYNAT, LONGCHAMP, Edition, COMME MOI and BING XU, to launch a series of limited edition panda-focused fashion that reflect Sichuan elements, highlighting the combination of fashion and art, engraving the memory of the city by blending different ideas. Since Chengdu IFS and the Saint-Germain-des-Prés Committee in Paris forged their international partnership in May 2017, the two sides have had multiple exchanges and cooperation in culture and art, already achieving remarkable results. The ongoing Chengdu Parcours Art Festival curated by Chengdu IFS writes a new chapter in their cooperation. The two sides will in the future continue to leverage art to promote bilateral exchanges and strengthen the connection between art and business, and between art and cities, ultimately making art an integral part of people's life. Chengdu IFS (Chengdu International Finance Square) is located in the central business district of Hongxing Road, a prime location in Chengdu, where the city's two most prosperous main roads (Hongxing Road and Dacisi Road) intersect. It is an urban complex with a total construction area of over 760,000 square-meters, including a 210,000 square-meter flagship shopping center, a 291,000 square-meter Grade A office building, the Niccolo with 230 guest rooms, and the IFS Residences - upscale serviced residences covering 76,000 square-meters. Chengdu IFS, due to its global leading architectural design, won the VIVA Design & Development award presented by the International Council of Shopping Centers (ICSC) in 2016, thus ranking Chengdu IFS as one of the first Chinese commercial real estate projects with a top global honor. The Chengdu IFS flagship shopping centre contains over 600 brands, more than 100 of which are appearing in Chengdu or Southwest China for the first time. As the most upscale and international one-stop shopping center in Western China, Chengdu IFS gathers numerous international top fashion brands, jewelry & watch shops, fashion and garment brands, children's clothing and supplies, a Lane Crawford Department Store, the Ice & Joy skating rink, the UA IMAX movie theater, and moreover, features numerous restaurants and a Global Food Court, offering consumers an international and diversified experience without needing to leave the city. Chengdu IFS will always adhere to the Innovative - Fabulous - Sharing concept, and continue to inject new vigor into the city. Since 2000, Parcours Saint-Germain has been an annual art event held in Saint-Germain, a Parisian neighborhood known for its art heritage and modern style. During the festival, the contemporary art installation will be introduced to stores, cafes and other unexpected venues, which enables the public can browse and explore the neighborhood and appreciate the many displays whilst discovering the many charms the art on display has to offer.